Last Friday it was forecasted that we were to receive our first hard frost of the season. With the exception of my cool weather crops (like peas, bok choy, beets, radishes, all my brassicas and mesclun who love the cold) most of my plants can’t take frost or a severe dip in temperature. In a panicked state I hurried about my garden picking green tomatoes like a squirrel collecting nuts. I ended up with well over 25 lbs of unripe tomatoes. Turns out we did not get an actual killing frost until this morning, but it was a necessary harvest that was going to take place eventually. I really love fried green tomatoes, however, I don’t see myself perpetually consuming them over the next two weeks. So my preservation quest began. 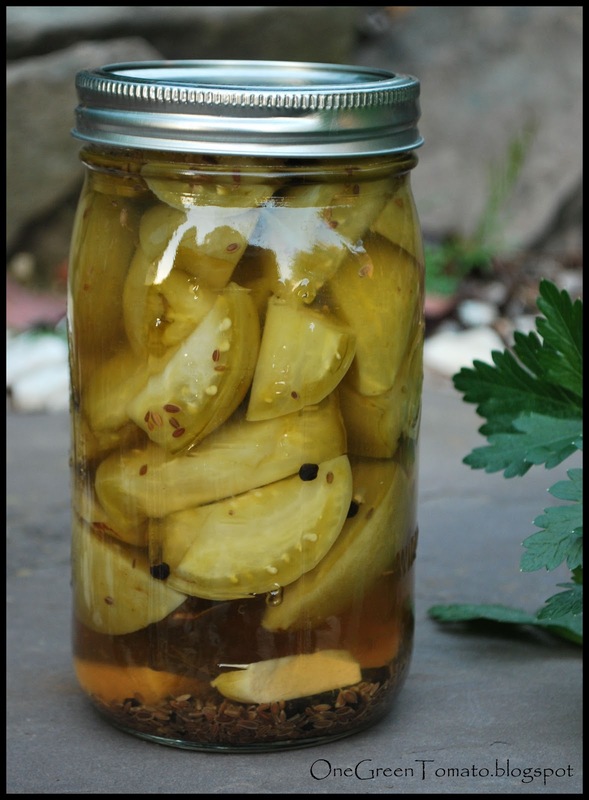 I found quite a few recipes that peaked my interest, one of which was to pickle them, which I did. Combine vinegar, salt and water to make a brine and bring it to a boil. In each hot jar add 2 bay leaves, 2 tsp dill seed, 1/2 tsp peppercorns and a clove of garlic, sliced. Add tomatoes and fill jar with hot brine. I did both pints and quarts. For the quart I upped the spice measurements a bit. Process in a BWB for 10 minutes. As with anything pickled the longer the brine has to develop the stronger and better the flavor becomes. I’ll be sure to crack one of these open in a few weeks and let you know how they turned out! **UPDATE** Mid January I cracked open a jar of this lovely green beauties, needless to say I ate almost the entire jar standing in the kitchen! They are awesome and I can’t wait to make more later this year!! Hi! I think this recipe made around 2-3 quarts. Can u please tell me about how many quarts this recipe would make? Or even pint jars? Hi Brenda! I think this recipe made around 2-3 quarts. Since the spices go into each jar as opposed to being divided among several jars you can just make a double bath of brine if you have lots of tomatoes. You can put your tomatoes into the jar first, then spices, and finally the brine. I think that is what I did. It was sooo many years ago I do t remember the exact amount. Thank you so much for your kind words! I’m going to experiment this growing season with canning green tomatoes for frying up over the winter months. Hopefully it is a success and I’ll be sure to share my adventure in a new blog post. Do these stay crisp after the water bath?